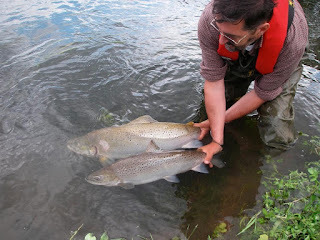 William Beaumont, a senior fisheries scientist at GWCT, with two sea trout from the River Frome, Dorset UK. AN environmental project that will provide vital research on rapidly declining salmon and sea trout (Salmonid) populations is set to receive a multimillion pound investment from the EU’s Interreg France (Channel) England programme. The project, called SAMARCH (SAlmonid MAnagement Round the CHannel), is being led by the Game & Wildlife Conservation Trust (GWCT). SAMARCH is a cross-border project, with 10 partner organisations - five in France and five in the UK. This project will use state-of-the-art fish monitoring facilities on five rivers across the south of England and northern France, including the Freshwater Biological Association’s River Laboratory on the River Frome, the Environment Agency’s facilities on the River Tamar, the Institut National de Recherche Agronomique’s facilities on Rivers Scorff and Oir and its specialist fish research team, as well as the Agence Française pour la Biodiversité’s facilites on River Bresle. Other partners include the Universities of Bournemouth, Exeter and Agrocampus Ouest, and Salmon & Trout Conservation UK, Normandie Grands Migrateurs and Bretagne Grands Migrateurs. SAMARCH will focus on the behaviour and mortality of salmonid populations in estuaries and coastal waters to determine where losses are greatest. It will also use DNA analysis to map areas in the English channel that are important for sea trout, provide new information to improve the tools used by the regulatory bodies in England and France to manage their salmon stocks. For example, by providing novel information on the long term changes in the growth rates of salmon using historical salmon scale collections and improve our understanding of the ratio of male and female salmon that go to sea using DNA. SAMARCH will engage with stakeholders and use the knowledge gathered during the five-year project (2017 to 2022) to update regulations in both France and England on the management of salmonids in estuaries and coastal waters which, are hoped will realise an increase in salmon and sea trout. The research is important because Atlantic salmon and sea trout, have declined by around 70% since the 1970s, they play a major role in coastal and river ecosystems and have a considerable economic importance through angling in Europe which is estimated to be worth as much as €1.2 billion a year. Dylan Roberts, head of fisheries at GWCT and project manager, said: “Until recently, management has focused largely on addressing issues in freshwater. However, we know that more than 90% of salmon smolts that leave our rivers for their feeding grounds in the north Atlantic die at sea. “Researching salmon in the sea has always been technically difficult, but recent developments in fish tracking technology, DNA methodologies and advances in data analysis techniques now enables us to quantify what proportion of this mortality occurs in the estuary and coastal areas, as well as their movements through these areas. SAMARCH will also sharpen the tools used to manage salmonid stocks and adjust our management strategies accordingly. “In light of the recent growth of coastal renewable energy schemes, such as tidal lagoons and underwater turbines and their potential harm on fish populations, SAMARCH will gain knowledge to provide pertinent information to manage this risk. SAMARCH is 69% funded by the Interreg France (Channel) England programme 3 which is part of the European Regional Development Fund 4. More information about the Programme can be found at https://interreg5a-fce.eu/.